The foam roller is a tool used in warm-ups and recovery. They are long cilinder shaped objects that come in varied densities. 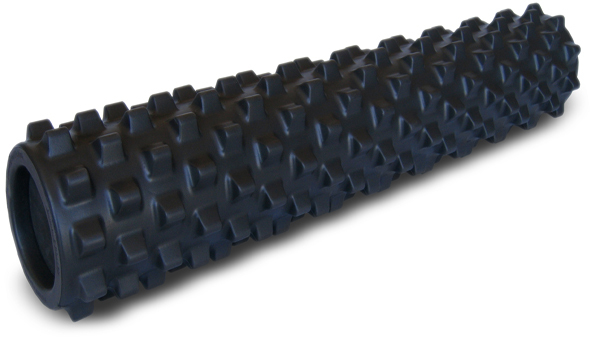 The purpose of this tool is to allow the user to give themselves a massage by rolling on them using their own bodyweight to add pressure. They are usually smooth, but some, like in the picture above have soft ridges that stick out. You will only find this tool in some gyms. They are usually color coded. White is the softest, and it is best to start with this density if you have never used it before. Blue is slightly harder, and the black foam is a medium density. The hardes rollers that you can find are made of PVC pipe. These rollers will give the highest intensity massage because they are completely solid. Foam rollers can be used before workouts or stretching as a means to warm up the muscles. They can also be used after workouts as a tool for recovery from a lift or athletic event.